The classical model is built on the “Trivium” as explained in Dorothy Sayers essay “The Lost Tools of Learning.” The design of the classical Christian model is intertwined with developmental stages that children naturally progress through as they grow. The proper implementation of this model lends itself towards students who have the mental discipline and ability to read an in-depth book, write discerning essays on the book, present lectures or debates on the contents of the book, and evaluate its contents in light of the Christian worldview. Its goal is to teach the student to think clearly and express himself persuasively. To accomplish this, we will be teaching children according to three stages of learning and development: the Grammar, Logic, and Rhetoric stages. These stages make up what is known as the Trivium. The word Trivium comes from the Latin prefix “tri” meaning three, and the Latin root “via” meaning way. The word Trivium literally means three-way; referring to the three ways of leaning that coincide with a child’s cognitive development. During the grammar stage, children compile information in an organized framework (or “grammar”) for each subject area. Children love to chant, recite, and memorize. Emphasis on repetition and rote techniques corresponds to a child’s ability to easily memorize and learn during this phase of development. The grammar stage also lends itself to God’s word and can be equated with knowledge. “The fear of the Lord is the beginning of knowledge” (Proverbs 1:7). “The ear of the wise seeks knowledge” (Proverbs 18:15). 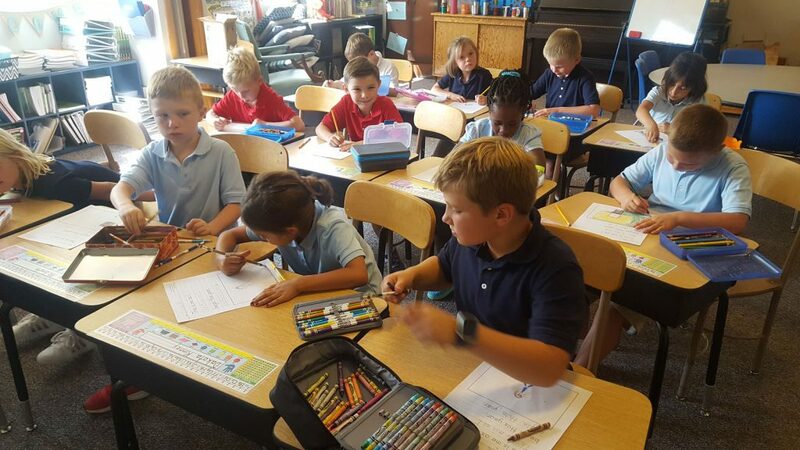 During these elementary years, we are focused on the fundamental facts and rules of each subject, the building blocks, the “a,b,c’s” of each core subject including phonics, English grammar, spelling, reading of the classics, Bible study, math facts, and penmanship. This is the time to fill them full of facts, such as the multiplication table, geography, dates, events, plant and animal classifications, anything that lends itself to easy repetition and assimilation by the mind. The material is presented to the students in an assortment of technologies to reach all types of learning styles. Through this varied use of repetition, a strong foundation is laid as the building block for future learning. During the second stage, commonly called the Logic or Dialectic stage, the child begins to understand that which he has learned and begins to use his reason to ask questions based on the information that he has gathered in the grammar stage. It is during this stage that the child no longer sees the facts that he learned as separate pieces of information, but he starts to put them together into logical relationships by asking questions. No longer can the American Revolution merely be a historical fact, but it must be understood in the light of the rest of what the child has learned. There is more through, more in-depth and careful discussion and examination of evidence. The students learn how to question, how to dialogue, and how to discern. This leads to the development of stronger critical thinking skills. Formal logic is taught as a class. It is also integrated into each subject matter enabling students to learn the rules that guide sound thinking. This stage corresponds with the biblical principle of understanding. Daniel was described as someone who was “endowed with understanding, and discerning knowledge” (Dan. 1:4). With the grammar and dialectic stages serving as building blocks, children in this stage progress toward articulating their views. Children are learning how to think out loud; they become concerned with expressing themselves and how their ideas are coming across to others. Biblically speaking the principle of wisdom is now evident. Wisdom is the ability to articulate and apply knowledge and understanding. “The lips of the wise spread knowledge…”(Prov. 15:7). “Wisdom is better than strength” (Prov. 9:16). Although we do not have plans to implement the upper grades at this time, our goal is that we would prepare our students to enter these grades ready to learn how to communicate clearly in written and verbal form, thoroughly research all subject areas, see interrelationships between subjects, and apply a biblical worldview to daily living and future learning. By recognizing and utilizing these stages throughout the child’s development, we are working with how God designed children in light of their ability to learn. See the Suggested Reading if you want to learn more about the classical model.